Between 2015 and 2016, there was an astounding four-fold increase in the number of new jobs created for Americans with disabilities, going from 87,201 new jobs to 343,483. And from February 2016 until May 2018, there was a steady improvement in the unemployment situation for people with disabilities, reaching an all-time low. However, in the last year, unemployment for Americans with Disabilities has stagnated. It increased by one tenth of a percentage appoint, from 29.9 percent in January 2018 to 29.8 percent in January 2019. Thus, the current unemployment rate for working-age non-institutionalized Americans with disabilities is at approximately 70.2 percent. 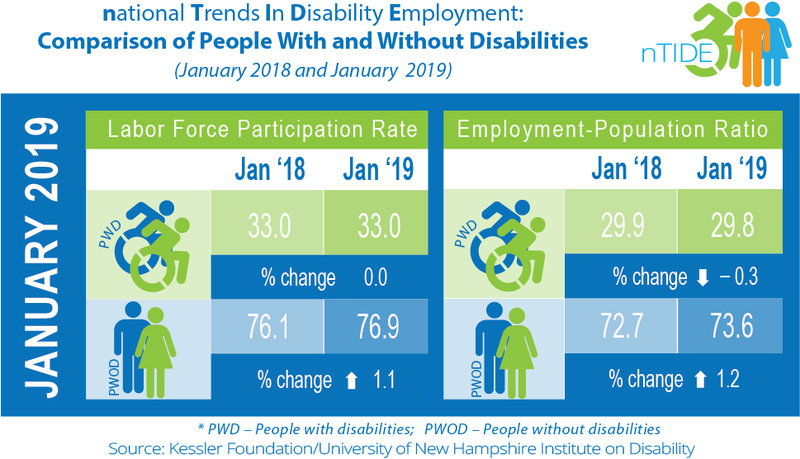 See nTIDE January 2019 Jobs Report: Job Numbers Hold Steady for Americans with Disabilities. It also is important to consider the labor force participation rate when evaluating true employment rates. Unemployment statistics only consider those who are employed or actively looking for employment. They do not consider the number of people who have dropped out of the workforce altogether. The labor force participation rate indicates a truer rate of employment by providing the actual number of people in the workforce versus the overall population. The labor force participation rate for working-age people with disabilities also has remained stagnant over the past year. It was 33 percent in January 2018 and remained at 33 percent in January 2019. 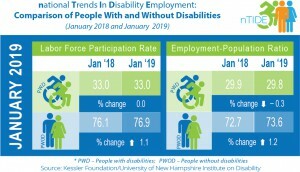 See nTIDE January 2019 Jobs Report: Job Numbers Hold Steady for Americans with Disabilities. Thus, of the 33 percent of Americans with disabilities who are in the workforce, only 29.8 percent of them actually have jobs. 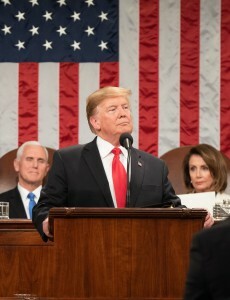 Trump paid tribute to Congress and his administration for passing unprecedented legislation to combat the opioid crisis. The opioid crisis has caused record high numbers of people struggling with addiction and losing their lives to overdoses. Presently, nearly one in ten Americans have drug addiction (mostly alcohol), and this number continues to rise, according to The Substance Abuse & Mental Health Services Administration (SAMHSA). Addiction is a mental health disability, and this legislation could save the lives of Americans with drug addictions. 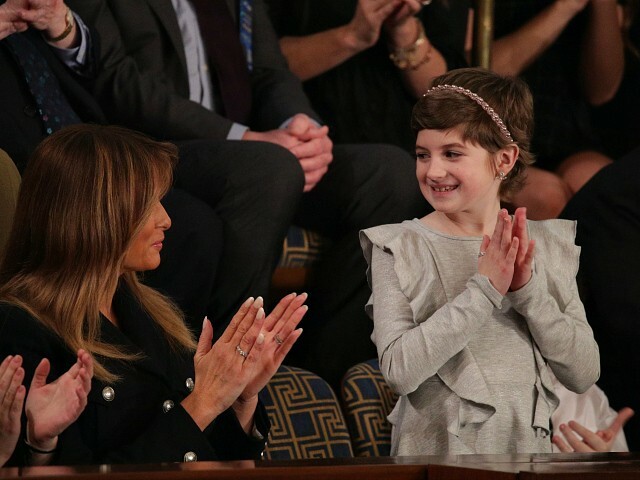 To humanize the importance of this endeavor, the First Family presented their special guest, Grace Eline, a 10-year-old from Long Hill, New Jersey, who was diagnosed with a germ cell brain tumor last year. She received several rounds of radiation and chemo over six months. And in October, doctors pronounced her cancer-free. What was not discussed, however, was healthcare and pre-existing conditions. Children, either living with cancer or pronounced cancer-free after having cancer, are considered to have pre-existing conditions, which are at risk under current healthcare debates. 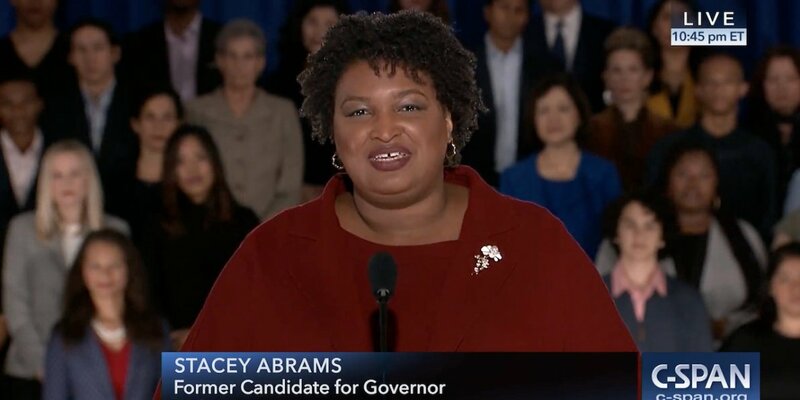 Stacey Abrams was the Democratic nominee for the Governor of GA in 2018, which she only narrowly lost. She made history during February’s African American History Month as the first black woman to give the Democratic response to the State of the Union. While she failed to mention people with disabilities by name, she discussed the struggles she and her family endure because of her father’s diagnosis of prostate cancer. She, like approximately 50 percent of the American population, has a loved one with a disability. She noted that while deferring medical bills is possible, deferring cancer treatment is not–setting a stark juxtaposition to the President’s idealistic picture of a cure to cancer. According to the 2012 census, approximately 21 percent of Americans with and without disabilities were uninsured. If treatment or a cure becomes available thanks to great strides in research, it is useless for those who are uninsured. Abrams pointed out that one of the best methods in increasing the number of Americans with healthcare is for states to expand Medicaid, government provided healthcare traditionally reserved for the poor. Medicaid expansion permits the section of the population who makes too much money to qualify for Medicaid and too little for an ObamaCare plan to buy into Medicaid through monthly premiums relative to their income. People with disabilities who receive SSDI are given Medicare after a two-year waiting period. However, Medicaid – not Medicare – is the only medical insurance that covers long-term healthcare, including nursing homes and, more importantly, personal care attendants, which ensures community-based independent living, rather than traditional institutionalization. Often the amount of SSDI people receive disqualifies them from receiving Medicaid, leaving them unable to regain independence and re-enter the workforce. As people with disabilities account for 20 percent of our population, Medicaid expansion would greatly benefit many.